The sight of Tyler Colvin being hit in the chest by the splintered bat of teammate Welington Castillo has once gain shined a light on bat safety…and with good reason. However, the overreaction to the incident could wind up doing more harm than good. 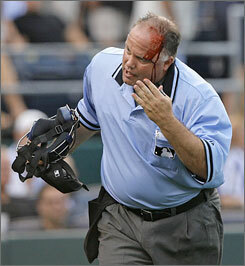 Home plate umpire Brian O’Nora suffers a laceration to his forehead after being struck by a broken maple bat during a game on June 25, 2008. Since that time, MLB has implemented new manufacturing guidelines for bats that were intended to reduce the risk of similar incidents, but many around the game are calling for more significant actions (Photo: AP). The immediate response from most corners has been to once again call for the abolition of maple bats. However, according to MLB executive vice president Rob Manfred, such a step is prohibited by the lack of quality ash that would be needed to fill the resulting void. Instead, Manfred told Phil Rogers of the Chicago Tribune that baseball has refined the manufacturing guidelines for bats, an action that has resulted in a decline in the number that has shattered during games. So, if banning maple bats is not an option, which seems reasonable based on the alleged shortage in quality ash, what else can be done. Over at the fine Yankees-centric blog It’s About the Money (Stupid), Jason Rosenberg has been advocating a product called the BatGlove. According to the product’s website, the BatGlove is a polymeric adhesive that is fastened around the handle portion of the bat (kind of like an ultra strong saran wrap for the bat handle). In an interview at Rosenberg’s blog, BatGlove cofounders Phil and Steve Rauso claimed that their product has passed all required tests with flying colors, but the resistance of bat manufacturer Rawlings has thrown a roadblock in the acceptance process. Although the supporting evidence does seem to suggest that the BatGlove prevents bats from breaking into large pieces, the issue raised by Rawlings does not seem as if it has been resolved. In fact, in the interview, Rauso references a dispute with Rawlings and major league baseball over the costs and parameters of follow-up tests that has prevented further studies from being conducted. One of the concerns raised by Rawlings has to do with the potential for a “hinge effect” resulting in bats that use the safety device. While preventing a bat from shattering into pieces, the BatGlove could allegedly send the broken end back in the direction of the hitter, catcher and home plate umpire, according to the objection, resulting in increased danger to those parties. Although there has been no verified evidence of a hinge effect resulting from use of the BatGlove, it is very reasonable to see it as possibility. After all, studies done have occurred on bats being suspended from a device (see below), and not swung by a player. Furthermore, the product website refers to it as an adhesive tape that “can be applied by the player or any other person prior to the bat being used in less than 30 seconds”. Although convenient, this also raises questions about the product’s reliability and safety if applied improperly. Perhaps these issues could be easily dismissed with further testing, but that takes time. The process may be frustrating to the BatGlove’s cofounders, but a slow and careful evaluation is still a responsible approach. In his SweetSpot blog, Rob Neyer also weighed in on the topic and provided a link to another product called Extratec, which according to its description seems to be very similar to the BatGlove. Although it doesn’t appear as if major league baseball has tested this particular product, it would stand to reason that any further evaluation compare the two, not to mention other devices that may purport to accomplish the same goal. More than his reference to possible alternatives, Neyer’s take was most interesting because of where he places the blame: squarely on the shoulders of the MLBPA. Assuming blame is the right word, Neyer is dead on. If players wanted safer bats, there is no reason why anyone else should object. Having said that, the idea that only a fatality will move the issue is more than a little extreme. After all, it’s not like broken bats have led to an epidemic of injuries, Colvin’s recent experience notwithstanding. Quite frankly, there are many more dangerous things at a baseball game than broken bats, beginning with the ball, but extending all the way to the beer the flows so freely in the stands during each game. In other words, if the chief concern is really saving lives, safer bats probably wouldn’t be very high on the list. If products like the BatGlove are truly effective, then major league baseball and the MLBPA should have no problems with its implementation. That doesn’t mean, however, that they should rush into a solution for a problem that isn’t as pressing as some seem to suggest. Instead of bickering over the pace of implementation, those advancing new innovations would be better served by continuing to work with baseball on testing their products. Bristling at the game’s slow acceptance of change won’t speed up the process.